After two years on the campaign trail and eight hectic years in the White House, Michelle Obama is relaxed and ready to turn the next page. 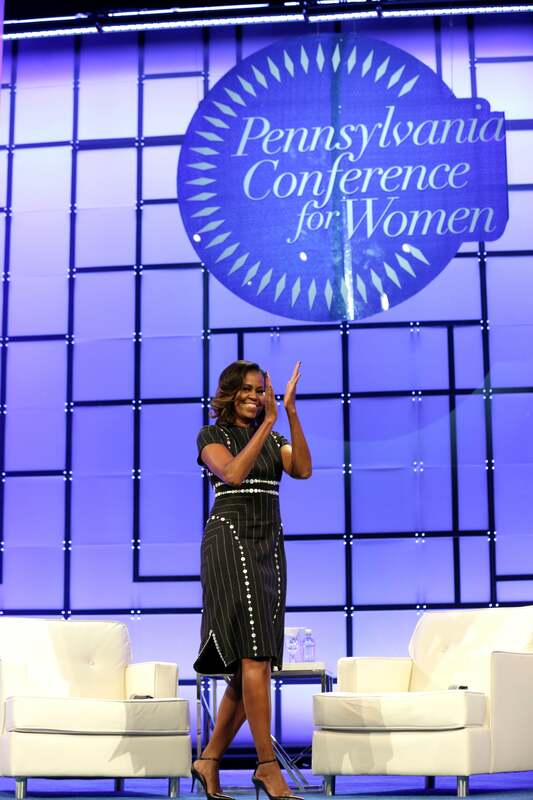 Speaking to an audience full of welcoming ladies at the 14th annual Pennsylvania Conference for Women in Philadelphia on Tuesday, she confidently told the crowd that she’s enjoying life. 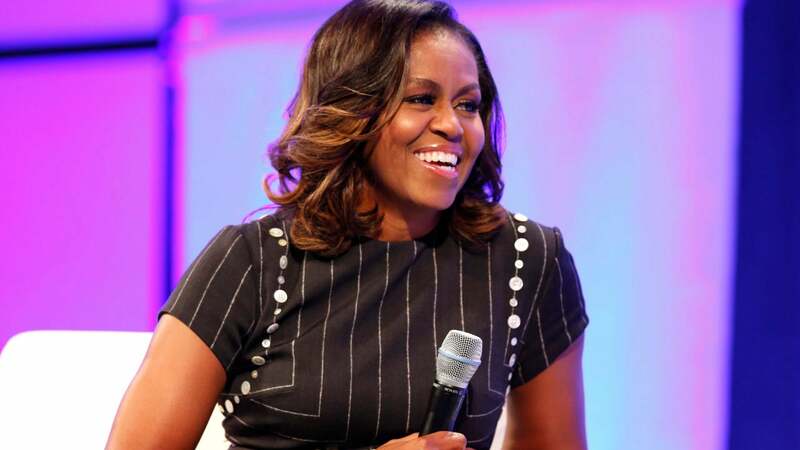 But the former First Lady is also charting plans with husband and former President, Barack Obama, to help build future leaders in America and beyond, specifically, women and girls. Despite being admittedly ready to exit the Oval Office, the proud Chicago native also made it clear that there was still much more to come from team Obama. 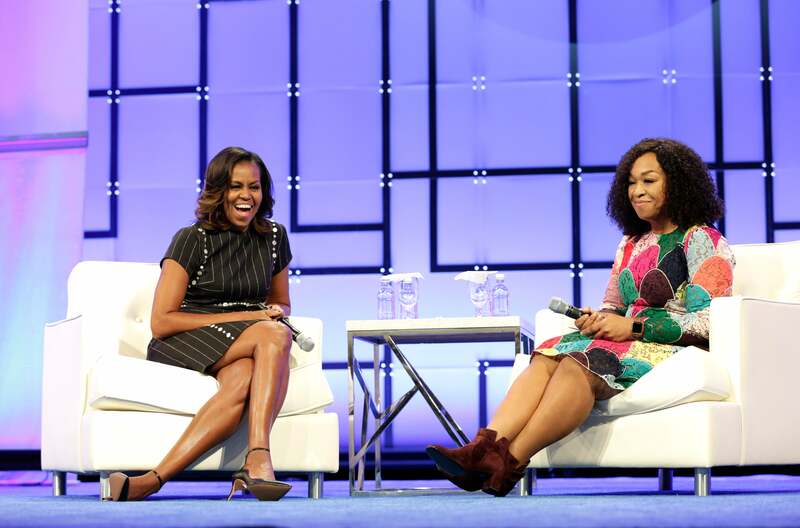 Michelle Obama and Shonda Rhimes at the 2017 Pennsylvania Conference for Women. Clad in a black pin-striped dress with ankle strapped heels, Obama sat down for an hour-long interview with TV mogul, Shonda Rhimes during the gathering. The event was a nonpartisan, nonprofit day of networking, professional development and personal growth for women. During her time as First Lady, Mrs. Obama launched and led four key initiatives. Let’s Move! aimed to address the challenge of childhood obesity; Joining Forces was about supporting veterans, service members and their families; Reach Higher was launched to inspire young people to seek higher education; and Let Girls Learn, to help adolescent girls around the world go to school. Obama, who made headlines last week for saying women who didn’t support Hillary Clinton at the ballot box “voted against their own voice,” also made veiled references to President Donald Trump. It was one of several moments in which the audience erupted in cheers and applause for the former FLOTUS. While speaking on the being in the space of dealing with overwhelming amounts of both support and criticism as First Lady, Mrs. Obama shared that while she didn’t suffer from “imposter syndrome,”—a term that speaks to feeling unworthy of a role—there were times when she questioned herself. “You wonder if you’re not doing enough. Are you good enough, smart enough, are you being relevant?” She also elaborated on how many women are coping with “small cuts,” which she described as vulnerabilities that build over time when they’re told not to talk up in class. And outright abuses-physical, mental and sexual. Men, she believes, are socialized differently. “Men fail all over the place and they’re good with it,” she said. “Women feel the need to be perfect. I’ve been at so many tables with fools who are imposters,” she said with a laugh. That’s one reason why Obama believes preparing women and men who can be future visionaries is critical. Obama’s message to women was two-fold: prepare for opportunities, and when you achieve them, be ready. “Don’t waste your seat at the table,” she said, adding that if “you aren’t comfortable, get up and let someone else,” assume leadership.